The Date Almond Shake = Delicious! 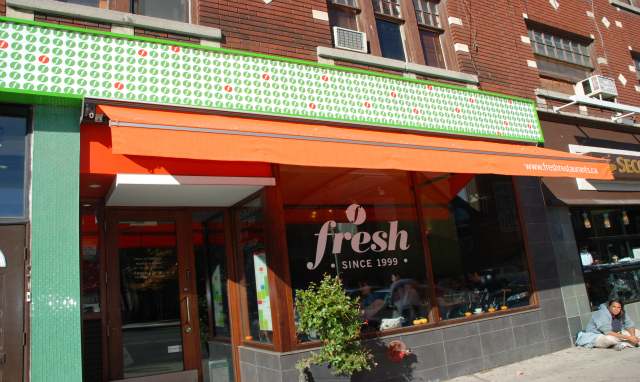 I have some UBER health nut friends who swear by this place Fresh. We went about six years ago for the first time and while I was a little hesitant on the whole vegan food idea I feel in LOVE with the date almond shake! I am currently trying to cut down on my carbs in the morning so this shake is a delicious way for me to start the day! Also Optional: 1 tbsp Cocoa powder for a chocolate treat, certainly beats a milkshake! Drink, love and be healthy! Also- I’m confused about your cutting carbs in the morning statement…. because all the ingredients are carbs. LOL. Do you mean like grain-type carbs?? Like oats, etc?? Hey!! Sorry for the confusion – by carbs I mean white stuff – white bread, pasta, etc… – I used to be a big puffy bagel and sugary peanut butter person in the am – terrible! I will certainly try those union rings – sound amazing! !